It’s been a crazy couple of weeks with the launch of the RO-T8 4N1 Handles we developed with our friends at N1 Education (Huge “thank you” to Coach Kassem and his entire team for all their insight and support). We are humbled to report that the first batch of the limited edition handles sold out in just over 48 hours! For those of you that got your hands on one before they were gone, we can’t thank you enough for your support too! Q: Will you be doing another limited launch of the RO-T8 4N1 Handles? A: Probably. Due to the overwhelmingly positive response, and the pile of messages we are receiving on social media, it seems like there are quite a few people who are bummed they missed out on the first launch. So, it’s likely we will do another run, we just need to get a good handle on the quantity/demand. If you would like to purchase the RO-T8 4N1 Handles, shoot us a message, comment on a post, put up a smoke signal, send a messenger pigeon, or let us know any way you can so we can forecast as best we can. Stay tuned for a more clearer timetable coming soon! 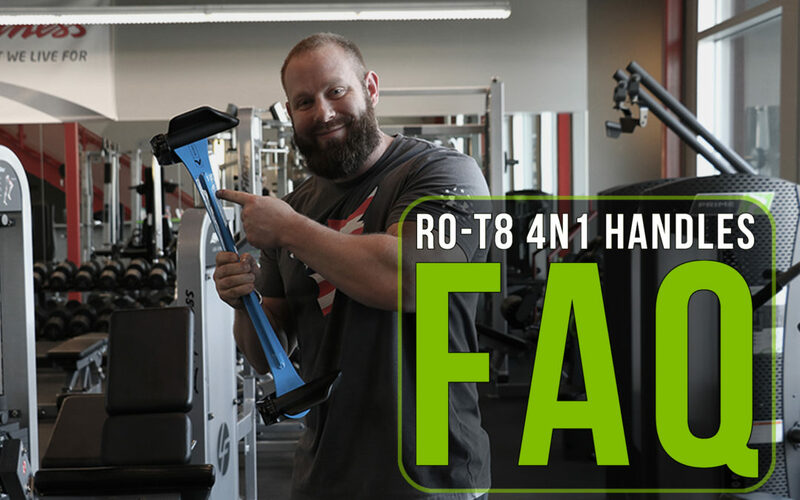 Q: What is the difference between the RO-T8 4N1 Handles & the RO-T8 3N1 Handles? A: Quite a bit actually. The name actually gives away one of the biggest differences, the 3N1 handles are exactly that, 3 handles in (N) 1. Same goes for the 4N1 handles. The 4th setting is a fully pronated position (see image below). The other key difference is the width. The 4N1 is 20” wide, while the largest 3N1 is 14” wide. One doesn’t really replace the other, they both offer their own advantages. If you’re a biomechanics nut like us, check out this video from Coach Kassem where he takes a DEEP DIVE into the details and does some great comparisons between not only the 3N1s, but other common bar/handles options in the gym. Q: Are you planning to add the 4th (fully pronated) setting to the current 3N1 Handles (14” and 6”)? A: Not at this time, and here’s why… From a biomechanics perspective, if the grip isn’t wide enough, the fully pronated position isn’t optimal. To get into a position where the fully pronated position is effective, there must be a certain amount of width to allow the elbows to travel in the proper path as the scapula retracts. For the vast majority of people, even 14” isn’t enough width. That’s why the 4N1 is 20” wide; to create enough width to allow for a proper starting position and ROM though the exercise. Q: Why were the 4N1 Handles blue? What will the color options be on the next run of the 4N1 Handles? A: The 4N1 Handles were blue to represent the partnership on the product with N1 Education (whose primary brand color is blue). We wanted to incorporate them into the product as much as possible to not only support them, but to signify their “fingerprints” on the product if you will. That said, for the next run of 4N1 Handles, we will be going back to our standard color options of PRIME Green and Black. That said, look for more limited edition color options in the future across all the accessory products. Q: Why is international shipping so expensive and what are you doing about it? A: To all of our international friends and customers, we hear you, and we are working hard to bring those shipping rates down. We are in the process of adding FedEx to our shipping options, which will drastically bring the international rates down. It’s a pretty large undertaking, so we appreciate your patience as we work through it, but know that it is coming soon! We hope you found this little Q&A session helpful, but if we didn’t answer your questions, please feel free to reach out to us directly by shooting us an email to info@PRIMEfitnessUSA.com. As always, thank you all so much for your support and until next time, #FindYourPRIME.